My work shows scenes and situations of people in their daily lives from the field of documentary photography. 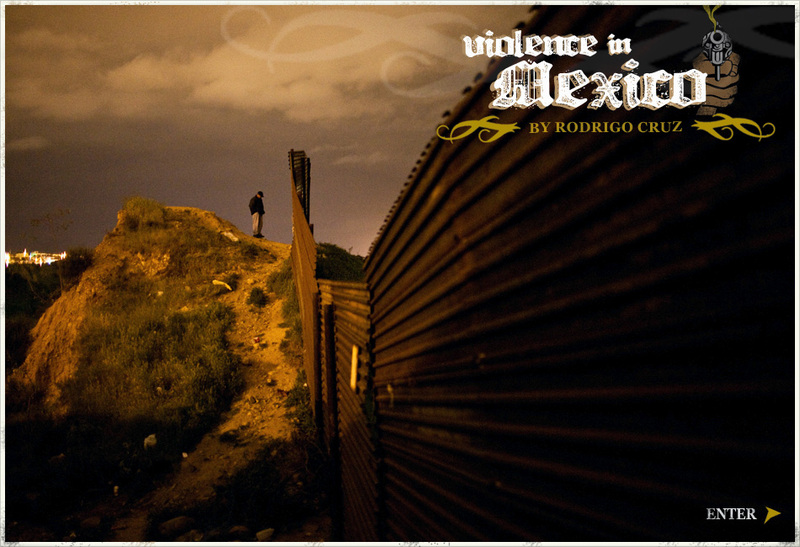 I did the project on Violence in Mexico in 2009 in different cities throughout the country. 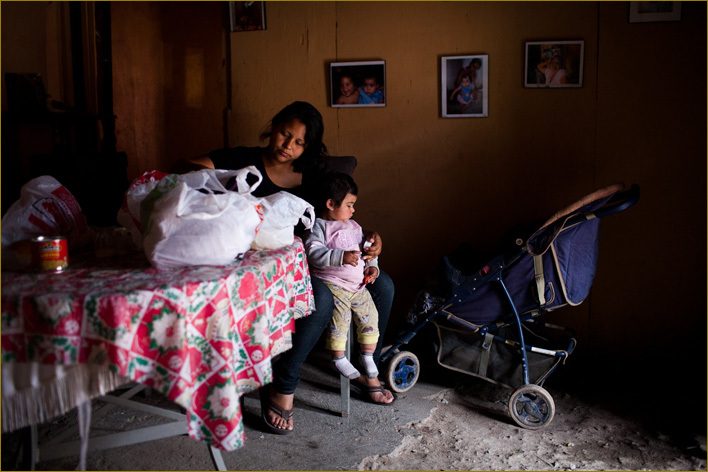 One of them is Tijuana, a border city where it is easy to see the violence caused by drugtrafficking, kidnapping, prostitution and drug addiction. This violence has also been encouraged by the poverty in which thousands of men and women live. After failing to make their way to the United State, they build metal, cardboard and wooden shacks in the hills or on one side of the wall dividing the two countries. There are well-known neighborhoods where gangs involved in arms dealing and the trafficking of cocaine, marijuana and crystal, a damaging, synthetic drug, operate. 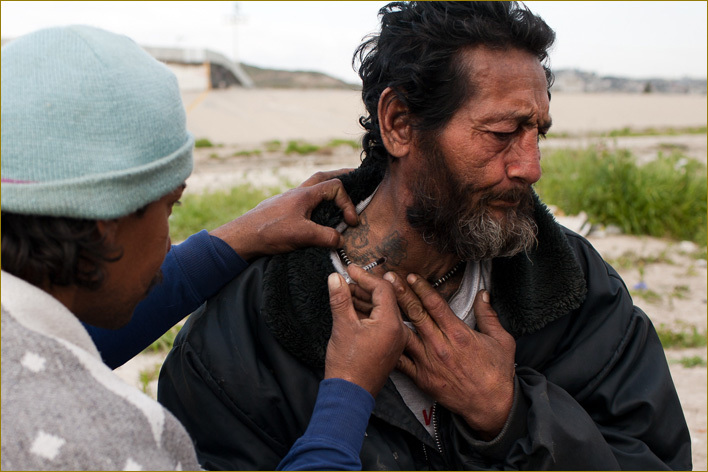 Near the Tijuana River Canal, there are groups of addicts that buy, prepare and use heroin on a daily basis. The downtown area is the most popular place for retail drug sales, as well as the prostitution of women and transvestites. At night, police patrol the city and try to fight organized crime, arrest the leaders of drug cartels, confiscate weapons and dismantle underground greenhouses used for growing marihuana. My photographs show the everyday nature of a prolonged, violent conflict in Mexico in which citizens have been trapped. 1/23 | The new wall reinforcing the border between Mexico and the U.S. has surveillance towers and night vision video cameras. This makes arms and drugs trafficking more difficult, and even more so for migrants attempting to cross over to the United States. Tijuana, Mexico. 2/23 | A woman hugs her son and checks what he bought in the market. 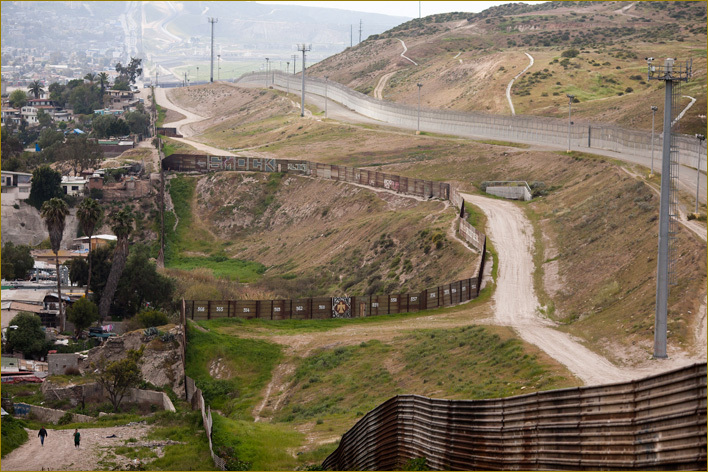 Their house is built on the wall dividing the United States and Mexico on the Tijuana border. 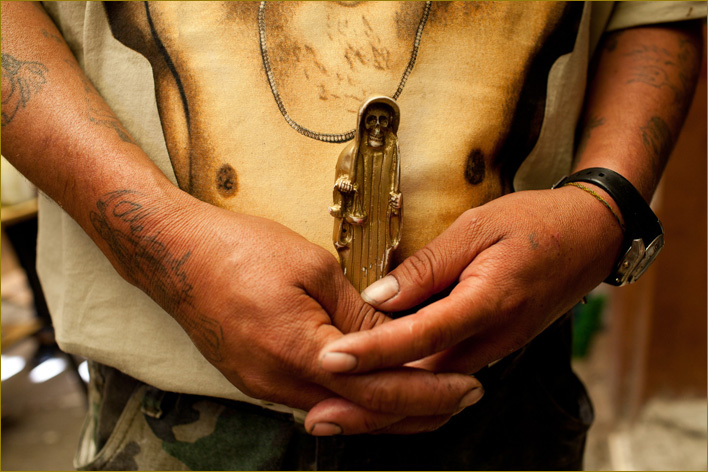 3/23 | A man with tattooed arms holds up a figure of Saint Death. Worship of Saint Death has spread throughout Mexico. She is mainly worshipped by prisoners and criminals seeking protection. 4/23 | A woman comes out of a place devoted to the worship of Saint Death, where people place candles and ask for their prayers to be answered. Mexico City, 1 July 2009. 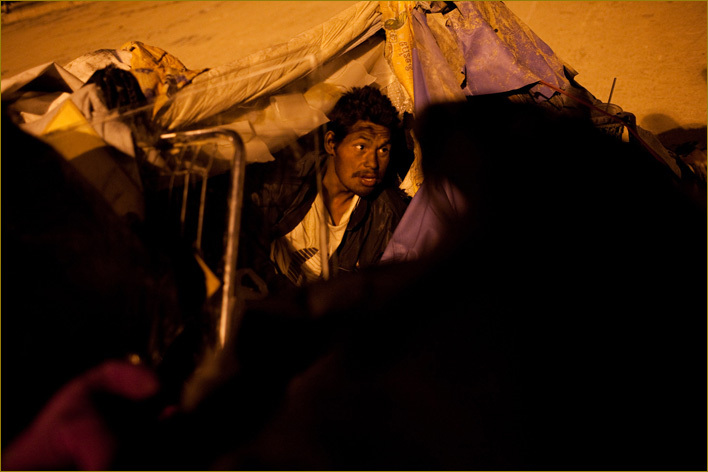 5/23 | Drug addictions live and shoot up heroin on the Rio canal, on the Tijuana border. 6/23 | A man shoots a dose of heroin into another drug addict’s neck. Tijuana, Mexico. 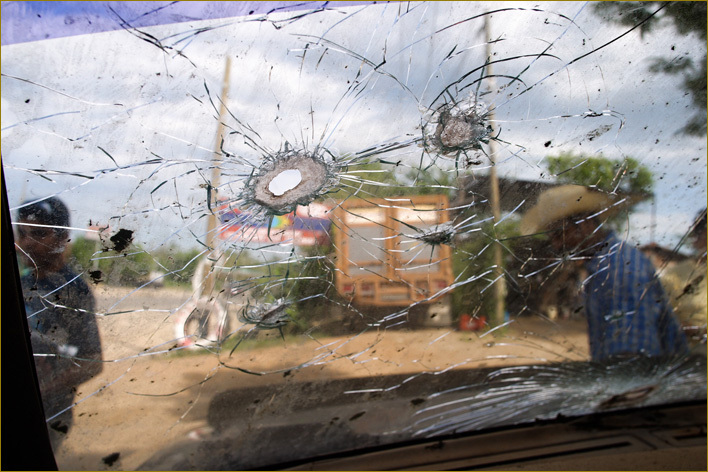 7/23 | Bullet marks inside a car where a person with high-caliber weapons was killed by a group of criminals in Guerrero, Mexico. 8/23 | Prostitutes hang around waiting for clients in the streets of downtown Tijuana, Mexico. 9/23 | Dancer at a night-club in Acapulco, Mexico. 10/23 | A couple walks down the streets of Tijuana, Mexico at night. 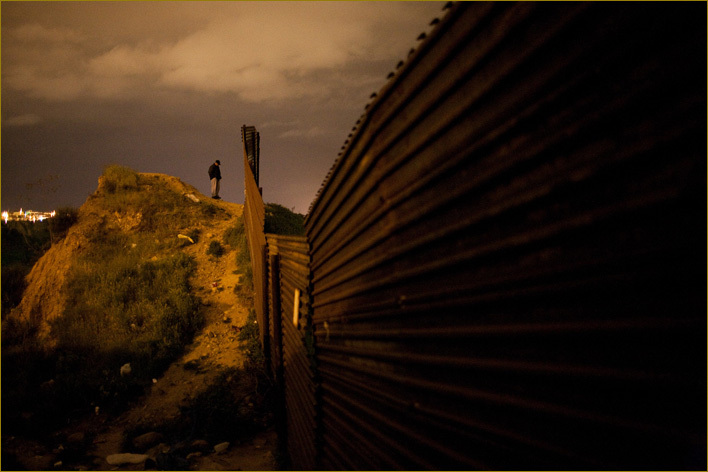 11/23 | A dejected man waits patiently during the night for the right moment to jump over the wall separating Mexico from the United States in the city of Tijuana. 11 November 2009. 12/23 | Two men prepare a syringe to shoot up a dose of heroin on the Tijuana border. 13/23 | A drug addict looks out of a house he has built from plastic waste. 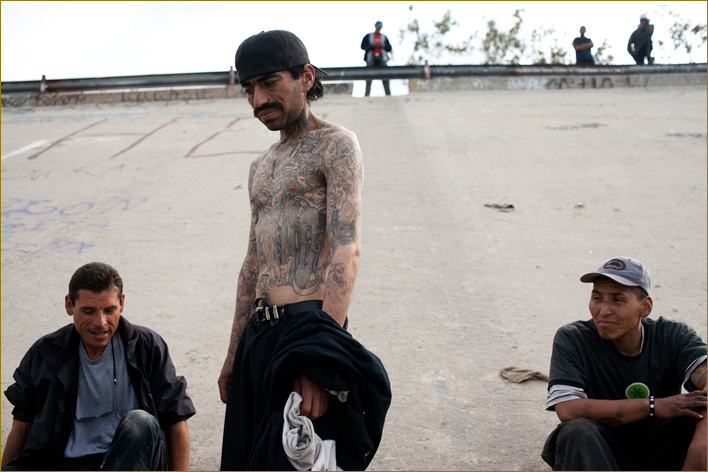 He lives next to other drug addicts on the Tijuana, Mexico border. 14/23 | An alleged drug peddler is arrested and frisked by the police. Tijuana is one of the cities where the largest amount of drugs is shipped to the United States. 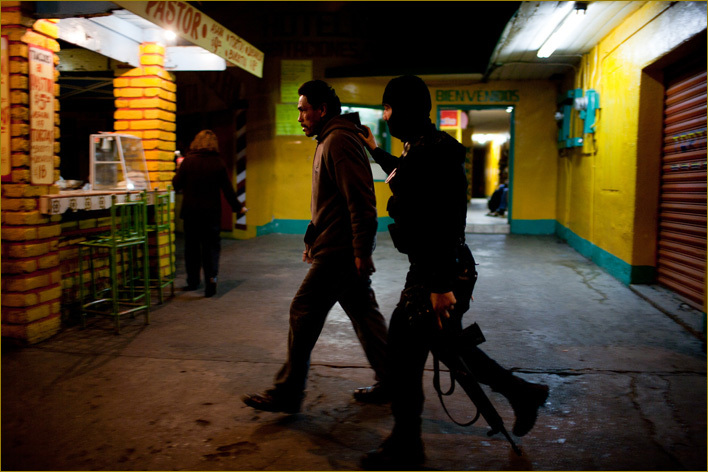 15/23 | An alleged drug dealer is arrested by an armed policeman when he was trying to escape in Tijuana, Mexico. 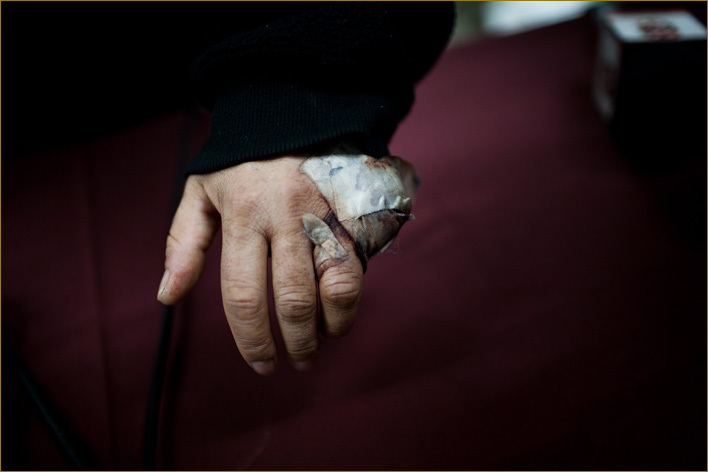 16/23 | A man’s hand is covered by tape protecting the wound caused when his finger was cut off by a group of criminals. This man was rescued from his kidnapper and taken to the Mexican army barracks in Tijuana, Mexico. 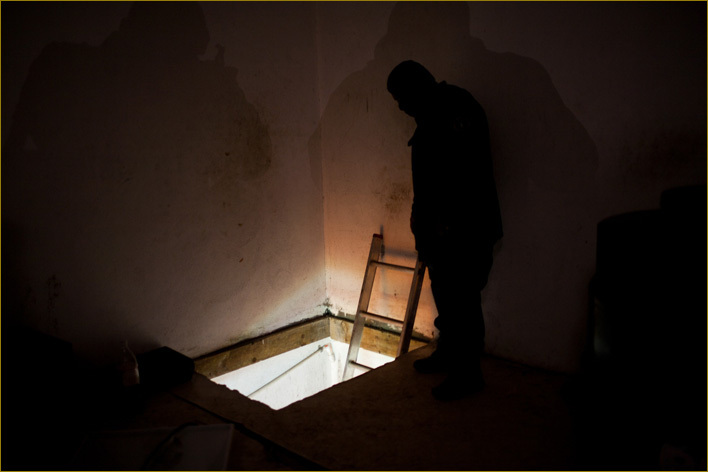 17/23 | A state policeman observes the hidden entrance to a basement where a marihuana greenhouse was found in a ranch in Tecate, Mexico. 11 March 2009. 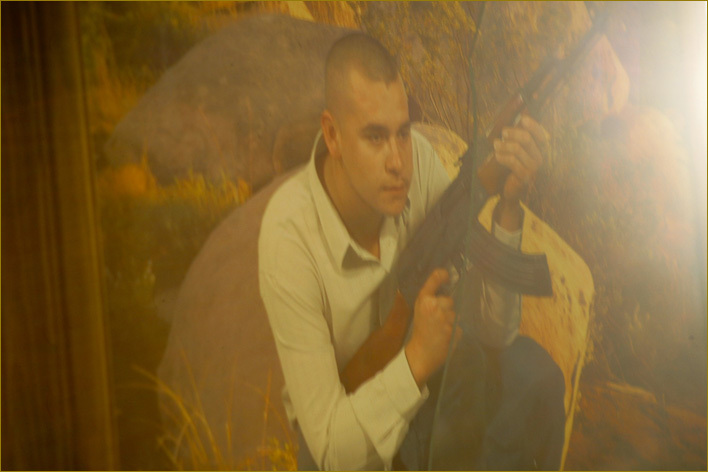 18/23 | Portrait of a man with a weapon inside the chapel dedicated to Jesús Malverde, known as “The Saint of the Drug Traffickers. 19/23 | Mexican soldiers prepare to leave the barracks to patrol the streets of Tijuana, Mexico. 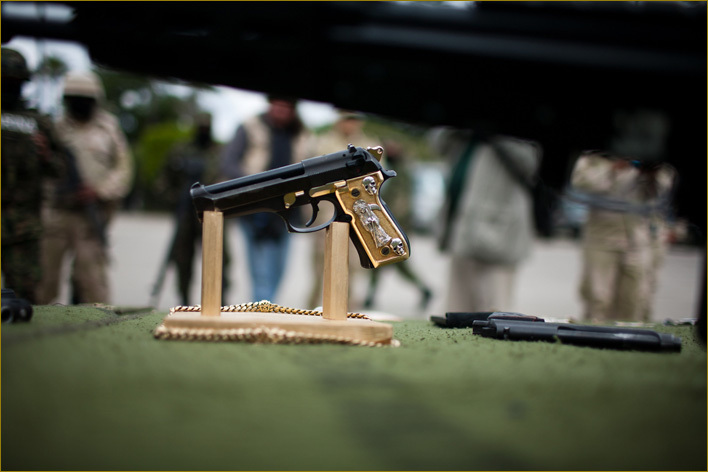 20/23 | A pistol with gold and silver incrustations and relief images of Saint Death was confiscated during an operation where they arrested a group of drug traffickers at a party. 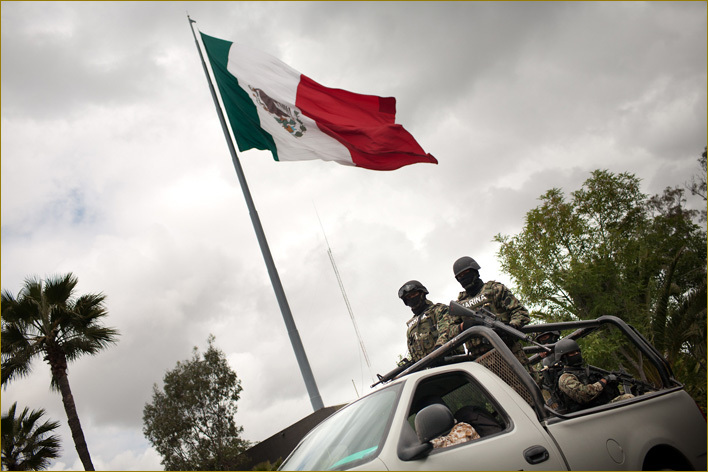 The weapons were displayed at a military base in Tijuana, Mexico. 9 March 2009. 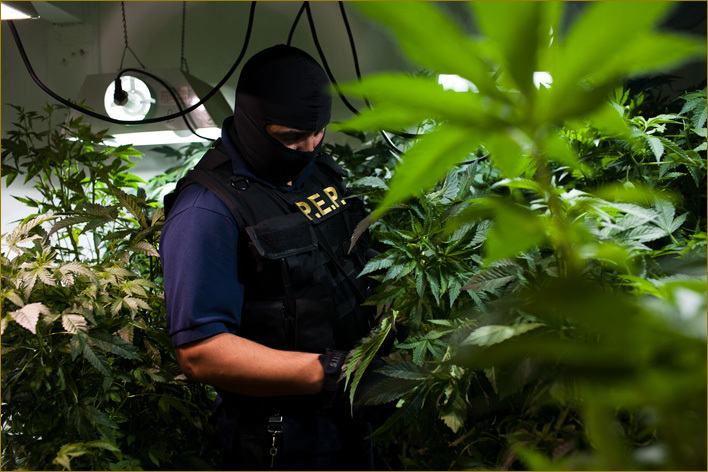 21/23 | A state policeman observes the marihuana plants found in a hidden greenhouse in the basement of a ranch in Tecate, Mexico. 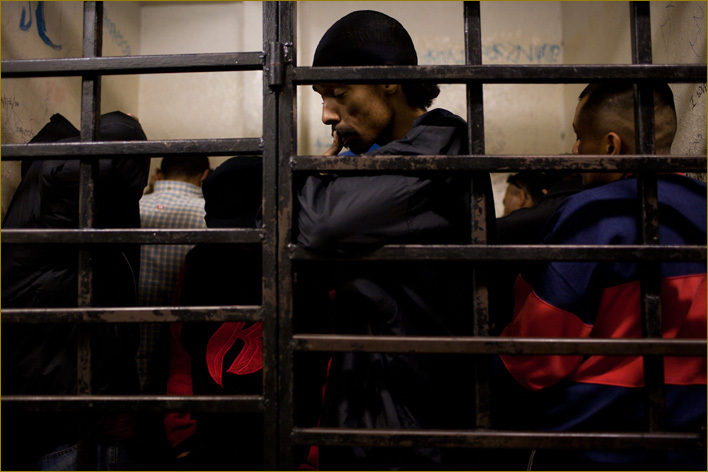 22/23 | Several men are arrested in a local police cell for alleged drug possession on the streets of Tijuana, Mexico. 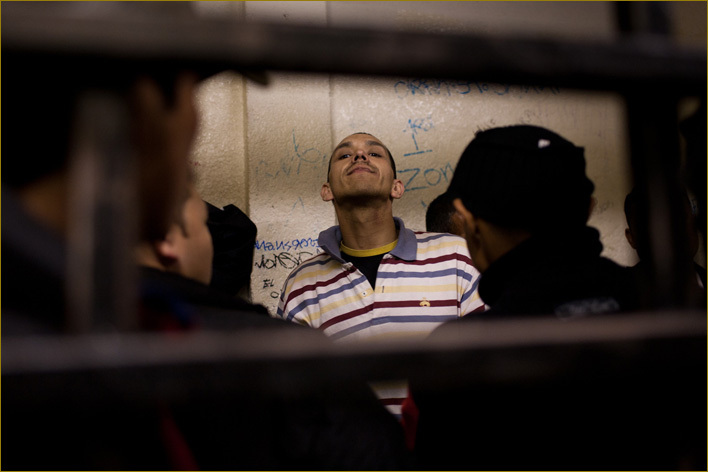 9 March 2009..
23/23 | Man arrested in a local police cell for alleged drug possession on the streets of Tijuana, Mexico. 9 March 2009..
Me gustó mucho tu trabajo, yo soy fotógrafo brasileño. Yo estaba en Tijuana hace cuatro meses, he visto al borde del río Tijuana, imaginar la dificultad de hacer estas fotos. Felicitaciones. Complimenti per il tuo lavoro d'indagine fotografica. Scavi una realtà che nessuno conosce. Qui sentiamo, ci giunge un'onda informativa tenue, non approfondita, una cosa quasi da intenditori intercettare i vostri problemi!! Che arrivano ad una dose molto forte di oscena violenza. Il sapore della morte sembra riuscire ad incarnarsi quasi in un credo religioso in alternativa al quale naviga il nulla. Sembra impossibile eppure....dietro ci sono storie, condizioni di vita e persone. Grazie per farcele conoscere attraverso le immagini reali. Tus imagenes son muy buenas, pero mas que por el aspecto técnico bien logrado, por la sinceridad y valentía con que transmiten las situaciones y emociones terribles que ha traido a nuestras vidas el cancer de la narcoviolencia. Salud Rod, excelentes imágenes de actualidad, un abrazo donde quiera que andes. Muy buena foto. El color ayudar a dar esa idea del infierno que está viviendo aquel personaje con la cabeza agachada; las sombras, hacen las veces de lo que no se ve, como suele ocurrir con la violencia. Definitivamente la regla que reza que menos es más aqui se aplica. Lo único criticable es ese diseño en la parte superior decrecha, definitivamente no va con la intención de la foto. Buenas Imagenes, en especial las primeras. Te felicito por el trabajo, las imagenes son contundentes y de gran impacto. Ten cuidado. The majority of financial loan companies provide the service of getting Payday Loans North Carolina for U.S. citizens. What can cause long-term use of Viagra Sale? In the network and other sources of information, there is no reliable data on the long-term use of Viagra and its negative effects on the body.